SKU: N/A. Category: Courses. Tags: C programming training, c++ training in bangalore, C/C++ training in bangalore, device driver training, embedded systems training in bangalore, linux kernel training, Linux system programming training, Linux training. Learnbay.in online is best embedded training institute in Bangalore providing embedded system courses & training by our top industry experts. If you have experience in other domains/technologies and want to start your career in embedded system, Learnbay is best place to go for Linux device driver training in Bangalore. An embedded system is a computer system with a dedicated function within a larger mechanical or electrical system, often with real-time computing constraints. It is embedded as part of a complete device often including hardware and mechanical parts. Embedded systems control many devices in common use today. 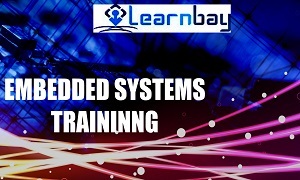 Learnbay is the best embedded training institute in Bangalore as we constantly update our curriculum based on the developments and updates in the industry. It makes us the leading device driver programming trainers in the city. Examples of properties typical of embedded computers when compared with general-purpose ones are low power consumption, small size, rugged operating ranges, and low per-unit cost. This comes at the price of limited processing resources, which make them significantly more difficult to program and to interface with. However, by building intelligence mechanisms on the top of the hardware, taking advantage of possible existing sensors and the existence of a network of embedded units, one can both optimally manage available resources at the unit and network levels as well as provide augmented functionalities, well beyond those available. For example, intelligent techniques can be designed to manage power consumption of embedded systems. C Keywords, C Data Types, Structure of a Simple Program. Basics of Functions, Functions Returning Non-integers,External Variables, Scope Rules, Header Files, Static Variables, Register Variables, The C Preprocessor, File Inclusion, Macro Substitution, Conditional Inclusion. Basics of Structures, Structures and Functions, Arrays of Structures, Pointers to Structures, Self-referential Structures, Type def, Unions, Bit-fields. The Core Operating System: The Kernel, The Shell, Users and Groups, Single Directory Hierarchy, Directories, Links, and Files, File I/O Model, Programs, Processes, Memory Mappings, Static and Shared Libraries, Interprocess Communication and Synchronization, Signals, Threads, Process Groups and Shell Job Control, Sessions, Controlling Terminals, and Controlling Processes, Pseudoterminals, Date and Time, Client-Server Architecture, Realtime. System Calls, Library Functions, The Standard C Library; The GNU C Library ( glibc) , Handling Errors from System Calls and Library Functions. Overview, Universality of I/O, Opening a File: open(), The open() flags Argument, Errors from open(), The creat() System Call, Reading from a File: read(), Writing to a File: write(), Closing a File: close(), Changing the File Offset: lseek(), Operations Outside the Universal I/O Model: ioctl() , File Control Operations: fcntl(), Open File Status Flags, Relationship Between File Descriptors and Open Files, Duplicating File Descriptors, File I/O at a Specified Offset: pread() and pwrite(), Scatter-Gather I/O: readv() and writev(), Truncating a File: truncate() and ftruncate(), Nonblocking I/O, I/O on Large Files, The /dev/fd Directory, Creating Temporary Files . Processes and Programs ,Process ID and Parent Process ID, Memory Layout of a Process, Virtual Memory Management , The Stack and Stack Frames, Command-Line Arguments (argc, argv) , Environment List. llocating Memory on the Heap, Adjusting the Program Break: brk() and sbrk() Allocating Memory on the Heap: malloc() and free(), Implementation of malloc() and free(), Other Methods of Allocating Memory on the Heap, Allocating Memory on the Stack: alloca(). The /proc File System, Obtaining Information About a Process: /proc/PID, System Information Under /proc, Accessing /proc Files, System Identification: uname(). Concepts and Overview, Signal Types and Default Actions, Changing Signal Dispositions: signal(), Introduction to Signal Handlers, Sending Signals: kill(), Checking for the Existence of a Process, Other Ways of Sending Signals: raise() and killpg(), Displaying Signal Descriptions, Signal Sets, The Signal Mask (Blocking Signal Delivery), Pending Signals, Signals Are Not Queued, Changing Signal Dispositions: sigaction(),Waiting for a Signal: pause(). Device Special Files (Devices),Disks and Partitions,File Systems ,I-nodes,The Virtual File System (VFS),Journaling File Systems,Single Directory Hierarchy and Mount Points, Mounting and Unmounting File Systems,Mounting a File System: mount() , Unmounting a File System: umount() and umount2() ,Advanced Mount Features , Mounting a File System at Multiple Mount Points, Stacking Multiple Mounts on the Same Mount Point, Mount Flags That Are Per-Mount Options ,Bind Mounts, Recursive Bind Mounts. A Virtual Memory File System: tmpfs, Obtaining Information About a File System: statvfs(). Overview of fork(), exit(), wait(), and execve(), Creating a New Process: fork() , File Sharing Between Parent and Child ,Memory Semantics of fork() , The vfork() System Call, Race Conditions After fork() Avoiding Race Conditions by Synchronizing with Signals Terminating a Process: _exit() and exit(), Details of Process Termination, Exit Handlers, Interactions Between fork(), stdio Buffers, and _exit() Waiting on a Child Process, The wait() System Call, The waitpid() System Call, The Wait Status Value, Process Termination from a Signal Handler, The waitid() System Call, The wait3() and wait4() System Calls, Orphans and Zombies, The SIGCHLD Signal, Establishing a Handler for SIGCHLD, Delivery of SIGCHLD for Stopped Children, Ignoring Dead Child Processes. Process Accounting,The clone() System Call, The clone() flags Argument, Extensions to waitpid() for Cloned Children, Speed of Process Creation, Effect of exec() and fork() on Process Attributes. Overview, Background Details of the Pthreads API, Thread Creation, Thread Termination, Thread IDs, Joining with a Terminated Thread , Detaching a Thread, Thread Attributes, Threads Versus Processes. Our embedded systems training program in Bangalore also covers salient concepts such as taxonomy of IPC Facilities, Communication Facilities , Synchronization Facilities, Comparing IPC Facilities. Overview,Creating and Using Pipes, Pipes as a Method of Process Synchronization Using Pipes to Connect Filters , Talking to a Shell Command via a Pipe: popen() Pipes and stdio Buffering ,FIFOs , A Client-Server Application Using FIFOs Nonblocking I/O, Semantics of read(). Overview, Opening, Closing, and Unlinking a Message Queue , Relationship Between Descriptors and Message Queues , Message Queue Attributes, Exchanging Messages, Sending Messages, Receiving Messages, Sending and Receiving Messages with a Timeout, Message Notification, Receiving Notification via a Signal, Receiving Notification via a Thread, Linux-Specific Features, Message Queue Limits,Comparison of POSIX and System V M .
Internets, Networking Protocols and Layers, The Data-Link Layer, The Network Layer: IP, IP Addresses, The Transport Layer, Port Numbers User Datagram Protocol (UDP), Transmission Control Protocol (TCP), Requests for Comments (RFCs). Kernel programming Processes: The Principal Model of Execution Process Address space System call File system Linux Device Driver Character driver Operation Kernel Synchronization IOCTL Calls Blocking IO Async Notification Interrupt handling Bottom Halwes SoftIrq Tasklet And WorkQueues Memory Management Page Allocator Memory Pool Memory Map Address Translation Page Tables Memory Management In Linux IO Block Device Driver Model PCI Network Driver basics of USB Device Driver. Building and adding code to Linux kernel for Friendly ARM and beagleboard board and experimenting with the driver available in kernel source. TCB of a process, Task state Transtion. Round robin scheduling. Preemptive task scheduling, Task name and IDs, Task Exception Handling. Semaphore Semaphore Control, binary semaphore, mutex semaphore, priority inversion, Deletion safety, spin locks. File , device, Driver, File name , Default device, File descriptor, open, close, read, write. Interrupt servi Major Number , Minor number concept, Char Device Registration, read and write on character device,IOCTLS, input-output operation on a character device, implimentation of a blocking IO, Notifications. Copying data in and out of the developed block driver. Introduction to PCI Architecture , Linux Network flow , Network driver structures and functions, Network driver code flow. **Hands on with LED drivers , Watchdog drivers. Learnbay.in online offers embedded system & Linux device driver training in Bangalore. The courses that we offer in our institute are created by technical experts and taught by top industry experts. To know more about the course details or enrolment procedure, contact us. As the best embedded systems training institute in Bangalore, we will ensure that you gain the expertise and the confidence to start a new career or perform better in your current role.